This has got to be the TOP most favorite Photoquote I have done. 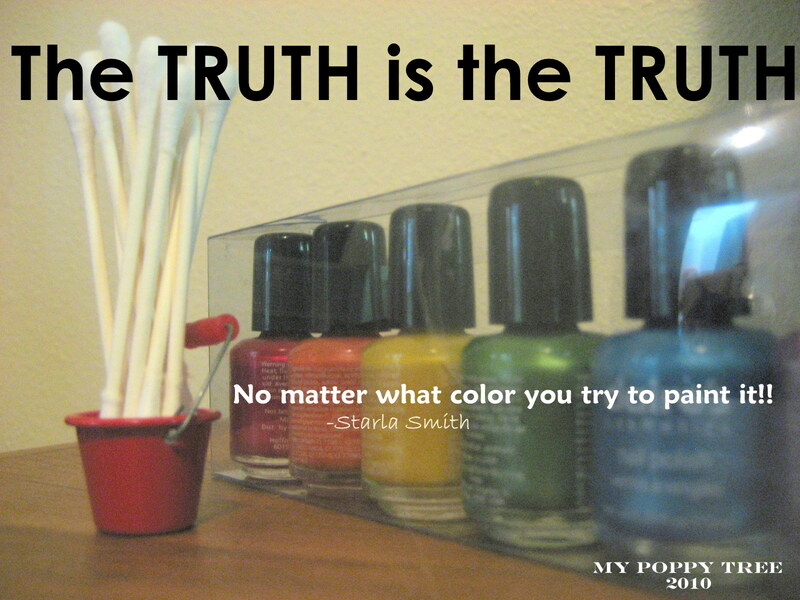 The TRUTH is the TRUTH …No matter what color you try to paint it! We all liked to color when we were little…at least I know I did. Some of us colored outside the lines, others like to be very very careful to be inside the lines and some like to make the picture a totally different color because we thought it looked better that way but in the end how ever we colored it …that is how WE did it. Life is a bit that way I think. Some of us are all over, inside and out side the box…breaking barriers and boundaries, some of us stick to the rules and regs getting as close to the line as possible without messing with the perameters, and some of us just change reality to suit ourselves…and in the end WE make life the way we want it by our ability to see, hear and know TRUTH. We create our own world essentially. We can buck the system and be a REBEL, we can even stick to the rules and be self-RIGHTEOUS, and we can even make up our own world and live in un-REALITY. But one way or another TRUTH/CHRIST comes knocking…. are you willing to see …YOU ARE IN NEED OF A SAVIOR. TASTE and SEE that the LORD is GOOD and HIS MERCY is NEW every morning. Ps…trust me we all (even those of us who believe in Christ) need a revelation that we NEED HIM daily. He is our PORTION of manna for every day. He is the BREAD and the WINE of our lives. Without HIM we are tossed to and fro with every blast of wind. Cling tight to HIM!!! He is your very BREATH.